Digital media technology is evolving at a rapid pace. Should you find that a recommendation here is outdated, please do let us know and we will be happy to assist you in finding another. Purchase many popular titles for children and teens on multiple formats. Many classic titles are available for free download to Kindle. Audible is a great resource that offers a wide selection of books (i.e., history, science fiction, classic novels, etc), as well as “spark notes” study guides. Buy books in multiple digital formats. B&N Jr. provides a link to titles for younger readers. This online library of digital books provides both text and audio versions of many trade and textbooks. A recommendation is required to qualify for the free membership; please contact the Yellin Center for more information. Download hour-long radio episodes which cover stories about history, economics, literature, geography, current events, vocabulary, jokes, and stories, all written for and performed by kids. 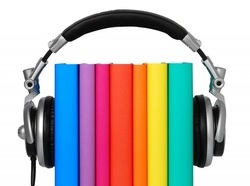 Select from tens of thousands best-selling audiobooks. Choose from a vast selection of children’s books, novels, non-fiction, textbooks, test preparation materials (SAT, ACT, etc. ), and books in various languages. Selections are available in multiple formats. Don’t forget to check your local library for lots of free audiobooks! Contains an extensive catalogue of children’s books. It also has an excellent portion of the site that is designed for teachers. Web Reader is an inexpensive, user-friendly app that reads web pages and PDFs. Users can save audio as .mp3 files for later listening, too. Web Reader’s voices are just as canned as those of other text-to-speech programs unfortunately, but its affordability and portability make it hard to beat. Male and female voices are available, and listeners can adjust not only the volume but also the speed at which the content is read. Web Reader can also work in conjunction with DropBox to read content stored in other formats, like Word or RTF. After purchasing both the Kindle ebook version, and the audiobook version from Audible.com, students can sit back and listen to the book of their choice while each word is highlighted on the page as it's read. Books acquired through Bookshare can now be both heard and read on Apple devices with Read2Go, which highlights each word as it is read. To help students read along with their Learning Ally audiobooks, an ereader will highlight each sentence as it is read. Soon, VOICEtext will highlight each individual word. This wonderful site allows children to listen to beloved picture books narrated by professionals. Each word highlights as it is read, encouraging kids to read along and improving word recognition. Students can choose from Lerner's large library of fiction and non-fiction texts, then listen and read along with the highlighting text. Offers electronic texts for all grades, plus adults. The desktop version and app (available now via Google Play and soon for Apple) read text aloud, highlighting each word as it is read. Access the site for free if your school or public library has an account; if not, a monthly subscription of $6.99 gives private users access to hundreds of popular titles.